In our next series of blogs we are going to be exploring self-care and self-help topics as a way to encourage and inspire people who are either going through a tough time and need help getting through it or people who are just curious about self expression, self optimization and creativity as a way to discover parts of themselves and find well being. This blog will be addressing self expression and creativity as a means to healing and well being. From the time we are born we are filled with the charge of creativity and the freedom of play. As babies we express ourselves with funny sounds, giggles and movements which slowly develop over time into more sophisticated expressions of our fantasies through drawings, stories and role playing. It is an innate part of each and every one of us. Sadly many of us experience a shutting down of our attention and expression of our creativity as we grow up either through adverse experiences in our families, ways in which we are labelled, the kind of schooling that we had, where we were encouraged or not and often internalised views that we hold about ourselves. It is tragic that many of us shut down this important aspect of our internal worlds simply because we feel that we aren’t any good. That childlike impulse to draw and colour and create simply gets shut away. Yet interestingly we also know that for centuries human beings have used creative expression to express their stories and emotions. It is accepted that artistic expression is a powerful tool to articulate the human experience on a personal as well as universal level. A formal discipline of art therapy came about in the mid 20th century when patients with turbuculosis cooped up in sanitoriums were seen to find relief and freedom in drawing and painting. The practice soon spread to mental hospitals and today we see art therapy as a firmly rooted psychotherapy practice with many studies in how it can be used to treat children, trauma, eating disorders, grief, loneliness, stress etc. Accessing and expressing our creativity as a way to express our unconscious selves can be a source of comfort in going through life’s major transitions and easing the pain and suffering of emotional and physical illnesses. It is a sacred tool to allow access to your inner capacity for creation and change and reminds you that you have this power if only you allowed yourself to let it free. 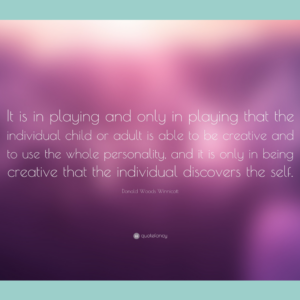 By simply allowing yourself the chance to play, like a child, without goal or judgment, you allow yourself the chance to find mindfulness, personal growth and healing. As expats living in Berlin it can be isolating and challenging to adjust to life in a new country and finding a common language can be difficult. Many people seek out an english speaking therapist in order to feel safe and understood even if english is not their mother language. Language matters. But what would it feel like to communicate beyond language, to be able to express the deepest aspects of yourself freely, without the constraints of words? To touch on the universal language of expression? Through art journaling we allow ourselves to open to this practice and heal ourselves in the process. Creative recovery exercise: As a useful practice exercise, and one that can enhance creativity and foster your capacity for expression, find a quite time and place to practice writing or drawing. For this exercise, write, draw, colour or glue whatever comes into your mind for 15-20 minutes. Try not to think or worry about making something good, only you will see it, the important thing is to keep expressing continuosly for the entire session. Just let yourself write or colour, a sort of limbering up exercise. We will return to more structured exercises later.